Oh, man. Where does the time go? My "Small Measures with Ashley" post is up over on Design Sponge. This week I'm offering suggestions for seasonal foods to go with pancakes, beginning with my "Strawberry, Rhubarb & Orange Maple Compote." And, just so you know, this stuff is great on top of more than just pancakes. Pair it with some yogurt, or put it on some pound cake, or snuggle it in with some vanilla ice cream. Tastes just like spring should taste. It's official. Huxley has caught his first cough. We're hoping that's all it is. A cough. And that it stays that way. But the coughing makes for a restless baby at night, which makes for a sleepless Mama at night, given that we bed-share. It's so sad to see the poor fella cough! His cough also makes him a wee bit needy. As such, I've barely been able to put him down today, because although there are play yards and nice swings and bouncy chairs on hand, it's in Mama's arms he most wants to be. We went to the annual Asheville Herb Festival yesterday, one of the highlights of my year. It's amazing to see all of that growth and life and green vitality everywhere. And the happiness it brings is pervasive. Everywhere you turn are smiling faces (well, even more so when you've got a little dude on hand). Huxley has taken to what I call "singing" lately, talking in a very high-pitched sing-song voice, which is what he was doing when I snapped the photo above. It's adorable. We often sing along, duet-style. He sang for a good bit at the festival, until he got squirmy and insisted on being held. We used the stroller instead to carry our haul! If Huxley (and I) feel up to it tomorrow, we're going to check out this festival tomorrow, which promises to be a good time. Otherwise, I've got loads of writing to do, planting to do, tending to about a million things to do. The weather looks glorious, though, so whether in town or chez English, I'm happy. Wherever you go, whatever you do, may it be grand! I'm the sort of gal that gets excited about reorganizing my pantry, takes pleasure in making a bed the right way (and I'm rather specific about this; I used to manage a B&B, mind you...), and wholeheartedly enjoys doing the laundry (even the bits of ironing, infrequent though they may be). I love anything related to the home, from cooking to cleaning to entertaining and decorating and beyond. If it's domestically-inclined, chances are I'm a fan. And so, it stands to reason that I would become friends with Kate Payne, at first digitally and later, in person. 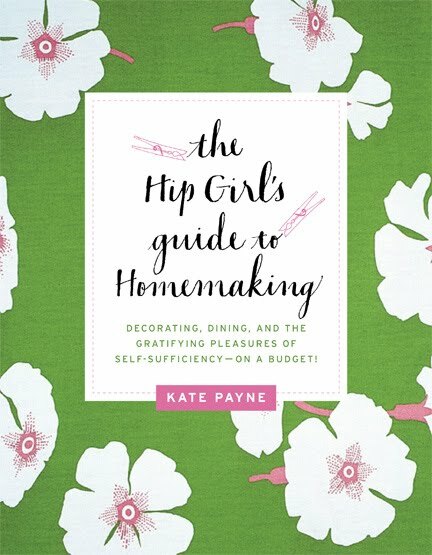 Author of the just-released Hip Girl's Guide to Homemaking (and blog of the same title), she loves the domestic sphere as equally as I, and wrote a book as a testament to her devotion. From clever ideas for thrifty decorating to details on how to build a proper compost pile, with etiquette tidbits like which side of the plate the fork goes on included for good measure, Kate's penned the perfect guide for becoming the hostess (or HOST!) with the most-ess (even though it's titled the hip "girl's" guide, in the introduction she invites readers of all genders along for the ride). Kate will be coming through the Asheville area in late May. I'll be hosting a potluck book launch for her chez English on the 22nd, and then later that afternoon, she'll be giving a talk at Malaprops. You can find information about the event here. I highly encourage you to go hear her speak. I can attest personally to her infectious enthusiasm, consummate graciousness, and all around cool-lady-ness. And, because she is so grand, Kate and her publisher are kindly giving away a copy of The Hip Girl's Guide to Homemaking to one small measure reader! 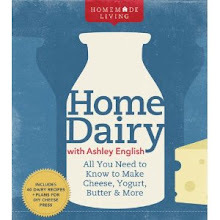 To enter, all you need to do is leave some comment about homemaking. It can be anything-that you loathe washing dishes, that you've arranged your book collection by spine color, that you built a bed that hangs from the ceiling. Anything. Just tell me a little something about you and the place where you hang your hat. I'm an inherently curious individual as it is, so I'd love to learn a bit more about you! The contest will run through Monday May 2nd, midnight EST. Good luck! Sarah, #4! Thank you immensely to all who commented (237 in total!!!). You are an inspired, and inspiring, group of folks packed with "can do" gumption! 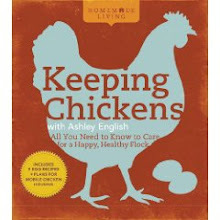 I'm off to teach my third "Backyard Chickens" class at AB-Tech in a few hours. Believe it or not, this marks only the 4th time I'll have been away from Huxley for more than, gosh, probably 10 minutes since his birth (the other three times for for my prior chicken classes and one WNC Beekeepers Association meeting). I just love being with him! He'll be in expert hands, though, with loving Hubs to keep him entertained and cozy. Oh, and check back tomorrow. There's another giveaway brewing! This giveaway train won't stop!!! Turns out I was closer to 3-4, according to Mom. But, here's the proof! Happy Earth Day, everyone! My "Small Measures with Ashley" post is up on Design Sponge. In recognition of the holiday, I've listed 25 of my favorite ways of enjoying the splendor of our planet. We've been humming along chez English, planting new blueberry bushes and blackberry canes, watching the peas tendril up the trellis, putting up hanging baskets with strawberry plants, messing around with lemon verbena in baking, noshing on Georgia strawberries, listening to the glorious sound of rain falling, eating outdoor brunch with friends, and generally enjoying all that the season offers. We're having friends over for dinner tomorrow evening, and then I plan to get busy in the yard and garden on Sunday while my mom hangs with Huxley. Wherever you go, whatever you do this weekend, may it be grand! *Image courtesy of Rene Treece Photography. **My friend Meredith made Huxley the little Viking hat. Isn't it amazing??? Like I mentioned yesterday, you "meet" the most amazing people on the internet (I should know, I met Hubs that way!). Nicole Fryling is one such person. 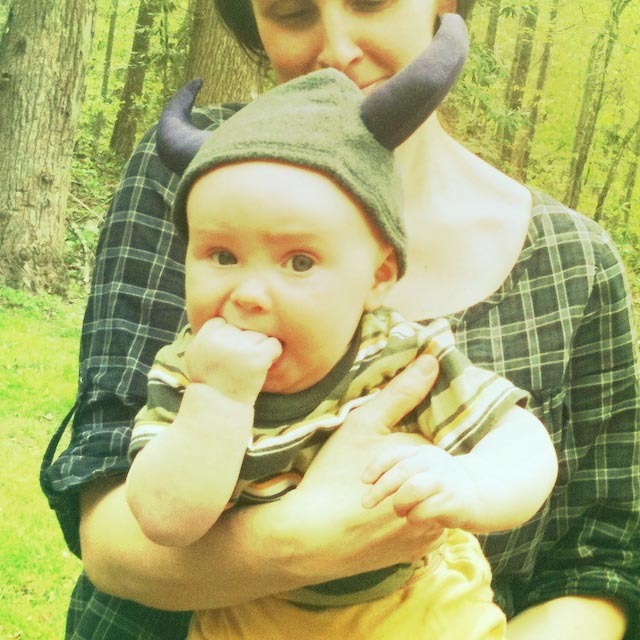 Mama to Cedar and Sequoia, partner to Steve, postpartum doula, and extract manager at Fungi Perfecti in Olympia, Washington, she also doles out inspired pearls of wisdom on her blog Howling Wolf. I'm not sure exactly how Nicole found me, but she's been a regular small measure reader for some time. She's also become a regular e-mail companion, where I pepper her with questions about natural mama-ing topics and she kindly, patiently, and thoroughly answers all my queries. She's a gem, and also, as evidenced by the photos above, an uncommonly generous person. The Life Box package arrived late last week. In it, Nicole sent two items for Huxley (a wooden helicopter and a hand-dyed top, for when he's a bit older), a bottle of reishi mushroom capsules, a signed by Paul Stamets himself (!!!!!!) copy of Mycelium Running, and a too-lovely-for-words calender from my beloved Nikki McClure. The box itself has seeds embedded in the corrugated cardboard and can be planted. Genius, right? I've been truly astounded, and humbled, by the kindness shown to me by readers of both my blog and books. Amanda of Bird for Bread, Cyn of River Dog Prints, Sara of Lost Bird Found, Elizabeth of The Adventures of Elizabeth, Susan of Bla Bla Kids, and Jenna of Cold Antler Farm along with Nicole are all ladies that (aside from Sara), I've never met in person and who have yet sent remarkably generous care packages to myself, Hubs and Huxley. You're all a testament to the goodness abiding in everyone. Nicole, thank you so very much. The capsules are being taken, the calender is hung by the door, the book is on my bedside reading table, and Huxley has been gnawing with happy abandon on the helicopter!!! *By the way, for anyone that might be curious, the background of the photos is one of Hub's paintings. Along with being an exceptionally kind spouse, a patient, doting Papa, a chef of absolute genius, and a companion to beat 'em all, he's also a trained artist (as in, MFA from Penn-trained). If you want to see more of his work, several posts from back in early autumn show a series of hand drawings he did. Just check the archives. I love the internet. I really, truly do. And I'm not ashamed to admit it because, oh, the places you'll go and, my, the people you'll "meet" whilst traversing its web. Like, say, Canada and its fine folks. I've long been enamored with Canada. From Vancouver Island's lush forests to Montreal's francophile flair to the Atlantic provinces craggy coasts (not to mention its puffins! PUFFINS, people, puffins!!! ), the nation to the north has always called to me. And now, through the magic of the interwebs, I've had the immense fortune of finding some kindred homesteading souls up there. 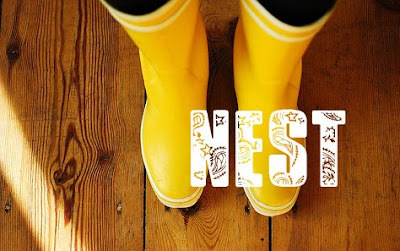 Well Preserved, Crackers, and Nest are three lovely blogs from three incredibly gifted sets of bloggers (each one is hosted by a dynamic duo). Their collective photography, recipes, resources, and anecdotes will have you pointing your compass north faster than you can say "eh?" Each one of these blogs has introduced themselves to me personally and supported all of my writing efforts and I, in turn, have become their loyal fan. I invite you to check them out. Don't be surprised if you find yourself wishing you were a Canuck, too. I can't recall exactly how I came to Jessie Knadler's blog Rurally Screwed , but I've been coming back to it again and again ever since. A former Manhattanite who left the big city for love in a small southern Virginia town, Jessie is a new mom (baby June and I share a July birthday! 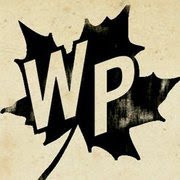 ), wife to Jake (who just shipped out to Afghanistan for at least a year), a writer with a killer wit and a keen eye for finding the humor (and the crazy!) in her new surroundings, and, now, co-author of a gorgeous cookbook! 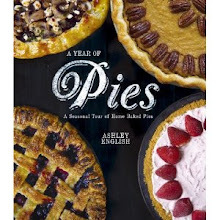 Tart And Sweet: 101 Canning and Pickling Recipes For The Modern Kitchen (Rodale, 2011) is Jessie's joint venture with Brooklyn-based chef Kelly Geary. It's a stunner, I've got to tell you. 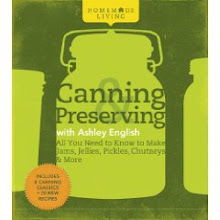 Full of enticing recipes, beautiful photography and exquisite styling, this book is one you definitely want in your canning repertoire. And, if the "fickle finger of fate" (something my 10th grade chemistry teacher used to say during impromptu audible quizzes) falls on you, it can be yours, for free! For this week's giveaway, leave a comment detailing something you've canned, something you intend to can, or something someone has given you that they've canned and you've enjoyed. If none of those apply to you, just say what you think about the whole canning revival in general. Foreign friends, I must offer my sincerest apologies, as this contest will be open to U.S. readers only. I'll hold the giveaway until next Monday, the 25th, at midnight EST. And do check out Rurally Screwed. 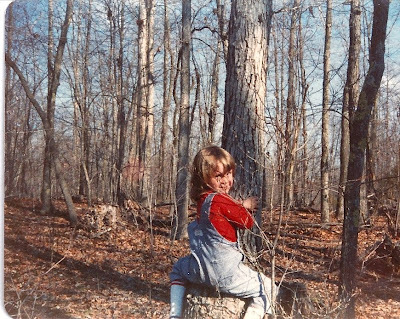 Jessie's musings on everything from deer meat tacos to the insane (inane?) antics of her community members are sure to elicit a chuckle or two from you. Mitzi! I plugged in #'s 1-171 in the random number generator widget and it gave me #2! Congrats Mitzi. I'll be sending Haley, Amy's publicist, your way for mailing contact info. And thank you so very much to all who participated. I'm hoping to make giveaways a weekly thing here on small measure. In fact, I'm doing another one today! Here in the States, it's not just Tax Day, it's also my Mom's birthday! Sending out big love to Huxley's "Gigi." I'm baking her this cake, which I plan to layer with orange curd and strawberry jam and cover over in lemon buttercream. Tomorrow my brother, sister-in-law and nephew are driving up from Charlotte to mom's place in Burnsville for a big family meal. We'll be feasting on Hubs' incredible fried chicken, mashed potatoes and, you guessed it, peas! Happy day, Mom! See you tomorrow! Happy Friday, all. My "Small Measures with Ashley" is up on Design Sponge. This week I'm continuing my "pea love", offering info on building a pea trellis as well as a recipe for a delectable pea frittata. I could eat peas everyday, so deep is my love for these tiny morsels. In fact, I think I'll go eat some now! Shelling peas are one of those vegetables that are just perfect when homegrown. Frozen peas do not compare to fresh peas that are sweet and crispy, even when cooked briefly in a water bath as called for here. It is a bit of a labor-intensive process to first blanch, then shock the peas in an ice-water bath, but it's worth it for the crisp-tender texture this extra step produces. Peas also pair beautifully with mint. You can easily substitute mint for the lemon balm in this recipe, or use equal amounts of both herbs. Bring a pot of salted water to a boil. While the water is boiling, shell the peas. Set up a water bath, filling a large bowl with cold water and ice. Set aside. When the peas have been hulled, drop them into the boiling water and cook until bright green and floating, 2 t0 3 minutes. Drain and immediately drop them into the ice-water bath, halting the cooking process. Give them a stir to make sure they are cool, then drain and set aside. In a medium-skillet over medium heat, melt the butter. Add the lemon balm and stir until the leaves make a popping sound, 2 to 3 minutes. Add the peas and stir to combine. When the peas are just heated through, about 1 minute, remove from heat and season to taste with salt and pepper. Serve immediately. More Garden Recipes: Lemon balm is a strong herb, so it's best to use it sparingly. For a summer sun tea, combine torn mint and lemon balm leaves, add water, and steep in the sun. Thanks Amy, and thank you, as well, to Sasquatch Books for this recipe!!! I made mine with homemade butter and fresh mint and lemon balm from our yard. It. is. so. good. So, about that recipe from Apartment Gardening I was going to post today? Can we take a raincheck/rainchick (explanation forthcoming...) 'til tomorrow? I wanted to take a photo to post with it, but it's been rainy and grey and generally not good for taking photos all day. Tomorrow, though, holds promise! And although today was a wet one, it was an awesome one. Local folks, get to the French Broad Chocolate Lounge, stat. Friends from afar, get to their website. Dan and Jael have one-upped themselves (again!! 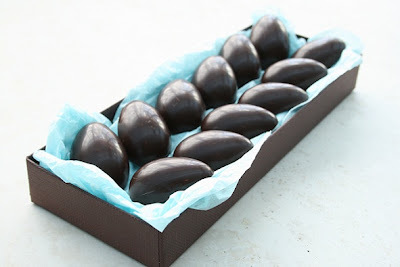 ), this time with all-natural treats for Easter, including peanut butter eggs and creamy-filled chocolate chicks. Here's their description of the new delicacies: "Organic peanut butter and Hawaiian milk chocolate, and light grey sea salt, covered in an organic dark chocolate eggshell. And then come the chicks. These absurdly cute little birdies are filled with four decadent creamy centers: peanut butter milk chocolate, coconut cream, strawberry lemon, and vanilla bean caramel." We sampled the peanut butter eggs and coconut cream chick today. This is the stuff of legends, folks. This is the type of treat you will pine for when it is no longer around. This is the work of masters. Don't delay. Get you some. See you with that recipe, tomorrow. I've been trying to grow things in any spot imaginable for some time now. Whether or not I owned the space made no difference. I'd put tomatoes and herbs in pots and rest them on my stoop or windowsill. Once, I was even so brazen as to attempt to grow green beans, tomatoes, and several other vegetables using only the sunlight filtering in from the small skylight in my 3rd floor apartment (it worked, a little; not enough sunlight coupled with a one-week failure to water the pots when I was away on vacation brought my tender green friends to their shriveled, stunted knees). In my own yard now, if Hubs and I had the time and budget, there's no limit to what we'd be growing. We'd expand our kitchen garden; culinary and medicinal herb beds; grape vine; apple, pear, and peach trees; vining kiwi; wineberry beds; and blueberry bushes and grow a bounty of foodstuffs. In addition to the wild foods available out here (we've got black walnut trees, nettles, fiddlehead ferns, wild violets, daylilies, and no doubt countless wild mushrooms growing in our forest-we really need a mycologist to walk the land out here and tell us what's what, mushroom-wise), there's ample room for putting in a small orchard (I'd LOVE to inoculate the bases of several hazelnut trees with truffles!!! CAN YOU IMAGINE???) in which we could grow nut trees and a few more pear, apple, and peach trees. I'd like to put in a few varieties of fig trees, as well. I'm moving our strawberry beds, so there's that. A full patch of asparagus, and artichokes, and rhubarb is on my wish list, too. I'd also really love to expand off of our kitchen with a mini conservatory where we could grow citrus trees during cooler months and transfer them outdoors when it's warm. Oh, the possibilities. All of my mentioning this serves simply to illustrate the point that I like to grow things. And I like to watch things grow. And I like to read about growing things. And I like people who like to write about growing things. Which is what today's post, and giveaway, is all about. Amy Pennington, to quote her book's back cover, is a "food writer, organic gardener, and owner of GoGo Green Garden, an edible-gardening business that builds, plants and tends gardens for city folk in their backyards. Amy grows, cooks and lives in a small one-bedroom apartment in the heart of Seattle." 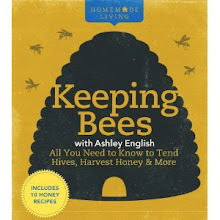 Her first book, Urban Pantry (Skipstone Press, 2010) was met with wide acclaim. Amy, you see, likes to grow things. My kinda lady. 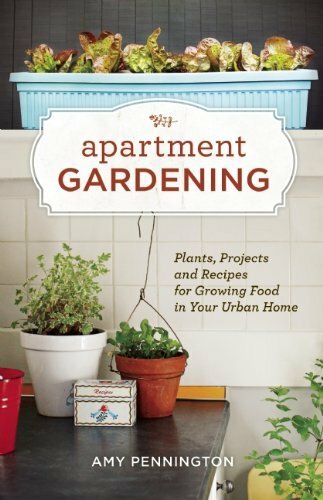 Apartment Gardening, Amy's newest book, was just published by Sasquatch Books the first of this month. I doesn't matter if the place you call home is a mere perch or a palace, there's great growing wisdom in here for everyone. Apartment Gardening is rife with ideas for planters (repurpose a metal filing cabinet! ), full of details for getting started (including what grows best in containers, how to care for your plants, and getting started with seeds and propagation), and packed with both culinary and body care recipes for making use of what you've grown. Amy's publisher has generously offered a copy of Apartment Gardening to a small measure reader. To enter the giveaway, just tell me what you'd like to grow. It can be anything. It needn't even be practical. Tell me about how you'd love to grow your own coffee beans for your java habit, or how you wish you had vanilla beans in your backyard, for your baking addiction. Hell, you can even say you wished you could grow money on trees-I wish I could! Pragmatic commenting is just as welcome, of course. I'll keep the giveaway open for comments until one week from today, April 18th, at midnight EST. When you comment, be sure to let me know how to reach you if you win, via either a link-back to your blog, or your e-mail address. Amy's publicist, Haley, will contact you for your mailing information after I've selected a winner (which I'll do using a random number generator). Tomorrow I'll be posting a recipe from Apartment Gardening, so be sure to stop back by. In the mean time, tell me, how does your garden grow? A monster of a thunderstorm ripped through our cove yesterday evening. Thunder! Lightening! 60 mph wind gusts! Hail! It was intense. Our German Shepherd, Fly, was terrified. She's one of those dogs that's afraid of storms, while our other dog, Dexter, the Labrador-something-or-other-mix, lay sprawled out on the couch with an expression reading "I could really use another pillow. You mind?". I was a bit on edge myself. 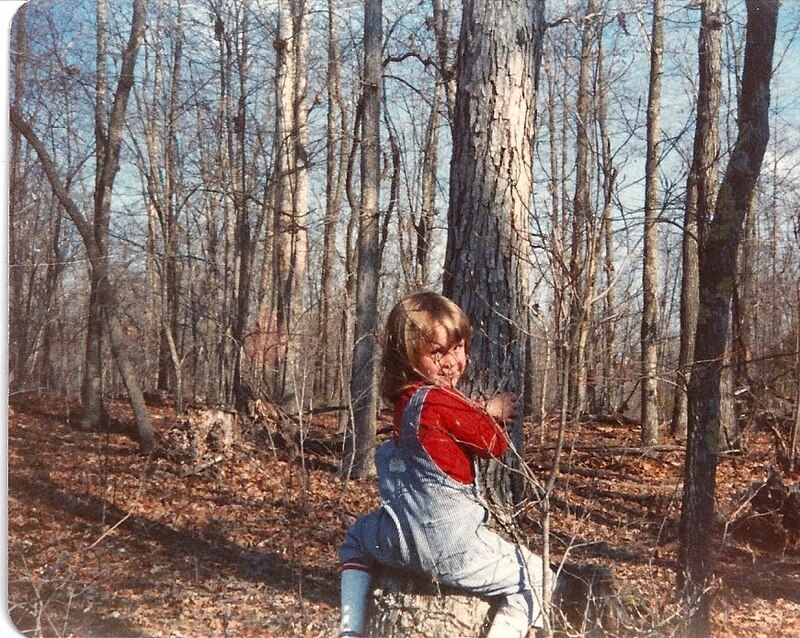 Long ago, I lived for four years in a small town (Richlands, N.C.-anyone?) that would blast an alarm every time the threat of a tornado approached. The fire department blasted that dang alarm so often that, to this day, I get crazy anxious whenever a storm rolls through. No harm was done, though, and afterwards-the SKIES! They were amazing, as if someone had brushed everything outdoors in the faintest hint of blush. These images don't really do the scene justice. It was, if I can muster up the courage to admit it, totally worth the storm. A big shout out of love and thanks is due to Katy over at The Non-Consumer Advocate. She sent this sweet little package of children's fiction (that belonged to her own boys when they were wee!) to Huxley. They're penned by no less than Ursula K. Le Guin, the science-fiction legend. Thank you so very much, Katy. Can't wait to start reading these to Huxley! Hi everyone! My "Small Measures with Ashley" post is up over on Design Sponge. This week I'm sharing tips on making homemade butter. If you've never made your own butter before, I highly encourage you to jump on it. NOTHING matches the flavor of just-whipped butter. You'll suddenly find yourself coming up with all sorts of "needs" for its use: Naked toast? Put some butter on it! Steamed broccoli? Put some butter on it! Saltine cracker? Put some butter on it. Consider yourself forewarned...(incidentally, this is reminding me of the Portlandia "Put A Bird On It" skit...Fred & Carrie should really do an "Ashevillia" spin-off; there are SO many consistent characters here that are RIPE for characterization!). I'm deep in the throes of writing-deadline land. My new technique of getting Huxley to take naps in our bed is really working out well. Wish I'd had that idea months ago! It makes sense; it's the place he sleeps each night already, so napping there is familiar, and safe, and reliable. Hopefully he'll go down again today for almost two hours like he did yesterday, and even that came on the heels of falling asleep in our jogging stroller while Hubs took him for a long walk down our driveway and along a country road nearby! 'Atta boy. Oh, and as for the book I'm working on, I've got to remain a bit mum on the topic for now. I promise to share more as it progresses, but, for the time being, my editor has asked me to keep tight-lipped on all the details. I can, however, share that it won't be part of my Homemade Living series. It's food-related, though, and I can assure you you'll love it. Promise. Tonight for dinner we feasted on this incredible salad with our entree. Hubs gathered up wild violets from the yard and tossed them with local greens, shaved Parmesan and a homemade honey-tarragon vinaigrette. AMAZING!!! Wild food is: 1) delicious, 2) nutritious, and 3) FREE!!! If you've followed this blog for any length of time, you've most likely heard me make mention of my buddy Jenna. A kindred spirit going it solo in "Veryork" (where Vermont and New York state rub shoulders), she's my girl. My bud. My homeslice. We're even on nickname terms (I believe I've referred to her as "J-Dawg", "J-Bomb" and more, while she's dubbed me "Boots"). Well, we long ago promised we'd promote and digitally scratch one another's backs (until we can meet up, real-time!) for all of our assorted and various projects, works, productions, what-have-you. This week, Jenna is offering up a giveaway. A really good giveaway. 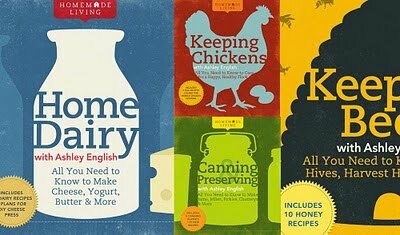 A signed copies of all four books in my Homemade Living series giveaway. A giveaway you don't want to miss. So, make haste and head over to her Cold Antler Farm. Enter the contest and then stick around and read about her recent debut into the wide world of lambing. And don't be surprised if you find yourself returning to Jenna's world again and again. It's informative, inspirational, endearing and so very much more. In her own words: "It's a Big time, folks." Hi everyone! My "Small Measures with Ashley" is up over at Design Sponge. This week I'm talking about making compound butters using springtime herbs. These lovely spreads take a dish from "ho-hum" to "DY-NO-MITE!" in seconds. Fer reals. Hope your Sunday is going well. It's hovering close to 70 degrees outside here, so, no complaints. My little dude is sleeping soundly beside me on the bed, flanked on both sides by pillows nestling him in. I tried this method of napping on him yesterday and, wonder of wonders, it worked! He dozed for over 2 hours last night while Hubs and I enjoyed a night in (like we have anything besides nights in these days! ), munching on pizza and watching a movie so bad that I dare not shame myself into sharing it here. My mom and grandmother are on their way over for some quality baby-cuddling time. I'm busy, busy, busy at work on my 5th book, squeezing in writing whenever, and however, I can. Our beehives are totally jamming. I'm going to work them later this week, on a warm, sunny day with less of a breeze than today. The chickens are content. We're working on getting our spring garden in. Hubs built a raised bed and trellis for peas yesterday and I'm hoping to get the starts into the ground today. Things seem to be humming along chez English! Wherever you are, whatever you're up to, may your day, and week ahead, be glorious and grand.